← The Adventures of Tom Woods & Bob Murphy! Ezra Ness, a winner in our libertarian art contest (see his award-winning entry here), recently sent us the piece at left in remembrance of Muhammad Ali’s passing. Ezra, a 17 year old artist from Kentucky, said that his Ali-inspired artwork was created to help pay tribute to this legend. Born in 1942 in Louisville Kentucky, Muhammad Ali’s career as a celebrated professional boxer is perhaps one of the most widely remembered attributes of this remarkable individual. However, Ali is also known for being a person who wasn’t afraid to stand up for what he believed in. For example, he once took a very principled stand against being drafted/conscripted into fighting for the Vietnam war, which Tom Mullen at the Huffington Post noted as being rooted firmly in the libertarian principle of non-aggression. Ali was noted as saying, “Why should me and other so-called ‘negroes’ go 10,000 miles away from home, here in America, to drop bombs and bullets on other innocent brown people who’s never bothered us and I will say directly: No, I will not go.” Because of this, Ali was stripped of his boxing title and sentenced to five years in prison. Although Ali would later win an appeal and avoid prison – the experience left him widely ostracized by numerous Americans for years after. Want to read more? Check out the Huffington Post article that was referenced above: Muhammad Ali was no draft dodger; His stance against war was libertarian. Also, to see more of Ezra Ness’s great work, please check out his tumblr page at Ezra Ness Art. You can also catch up with him on twitter. Plus, be sure to check out our libertarian artists page for our artist interviews and artwork from a variety of different artists in our community! You can also check out Libertopia’s own artwork page here, or download our 60 page art ebook at Libertopia: Collection One! 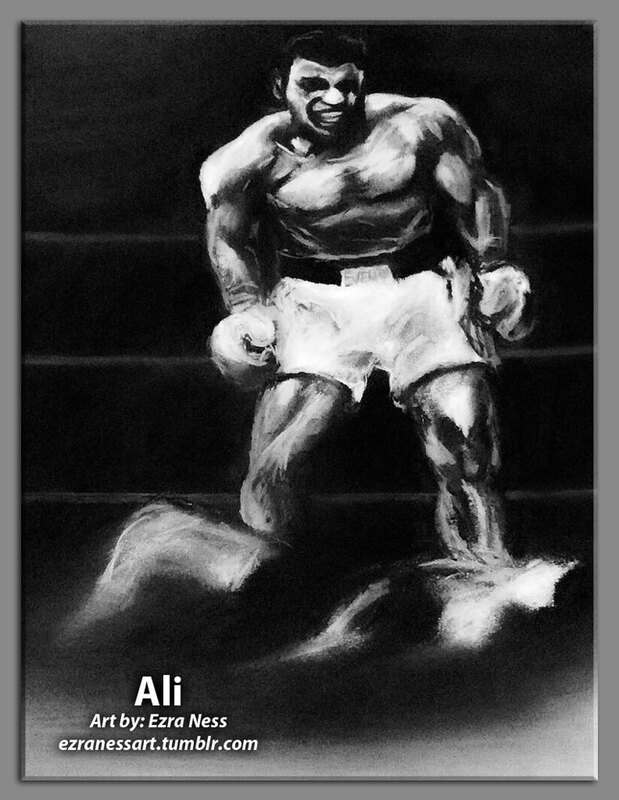 This entry was posted in Uncategorized and tagged artwork, Libertarian, Libertarian Art, libertarian artists, libertarian principle, Muhammad Ali, Muhammad Ali art, Muhammad Ali's career, non-aggression, professional boxer, Remembering Muhammad Ali. Bookmark the permalink.